Do you like Pikes.io? Share it with your friends. 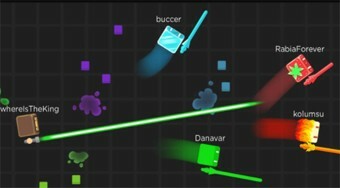 Pikes.io is another fantastic multiplayer game from the popular series .io games. In this game, move your armed hero with your hero around the playing area, collect colored dice to accelerate, and kill other players with your sword. Each time you kill an opponent, your sword will be extended.